I feel connected to this campaign because I am a mother of children and would do anything to make sure that my children had food on the table even if that mean that I don't eat that night. I am so happy that there are company's out there that team up with others to make sure that children all over the world do not go hungry they are using the money that they get from there dolls that they make and spend a lot of money on to make sure that everyone's children will have a lunch at school. When I was younger my school did not have free lunch so we had to pay for it or not eat anything that day. I am so grateful for the people who got together the free lunch program if it was not for them I would of went someday s with out eating lunch because my grandma could not afford the cost of the lunch ticket for four children. This company is amazing they hand knit all of their dolls and are made out of cotton. This company gets even better because when you buy a doll from them they will provide 10 meals to hungry children around the world through the World Food Program USA and Children's Hunger Fund. 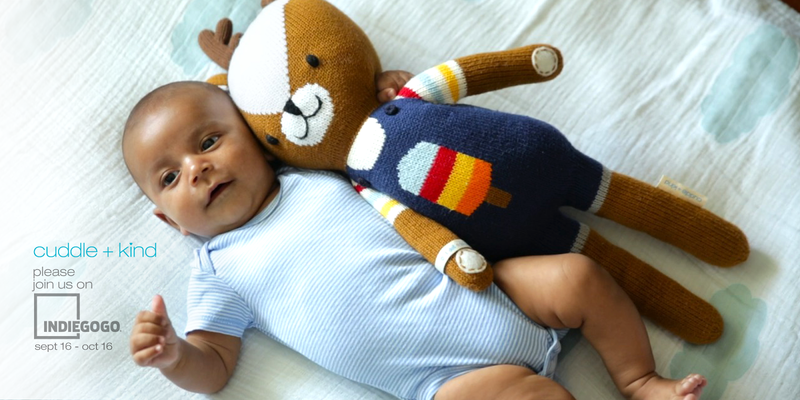 So when you go buy your baby a toy and we all want the best for our children please keep in mind cuddle+kind hand-knit dolls. They are a family of five on a mission to help feed children in need. There's nothing they love more than being parents. They think nurturing their three children is the most important, rewarding and sometimes challenging job in the world! With a background in health, They recognize the crucial role nutrition plays in a child’s development. They created cuddle+kind to help improve the lives of children and to make a difference. Their whole family is passionate about what their doing and loves every doll they make. They sincerely hope you will too.